From the author of Happiness for Beginners comes the instant New York Times bestseller (May 2018), an unforgettable love story about finding joy even in the darkest of circumstances. Margaret Jacobsen is just about to step into the bright future she’s worked for so hard and so long: a new dream job, a fiancé she adores, and the promise of a picture-perfect life just around the corner. Then, suddenly, on what should have been one of the happiest days of her life, everything she worked for is taken away in a brief, tumultuous moment. In the hospital and forced to face the possibility that nothing will ever be the same again, Maggie must confront the unthinkable. First there is her fiancé, Chip, who wallows in self-pity while simultaneously expecting to be forgiven. Then, there's her sister Kit, who shows up after pulling a three-year vanishing act. Finally, there's Ian, her physical therapist, the one the nurses said was too tough for her. Ian, who won't let her give in to her pity, and who sees her like no one has seen her before. Sometimes the last thing you want is the one thing you need. Sometimes we all need someone to catch us when we fall. And sometimes love can find us in the least likely place we would ever expect. How to Walk Away is Katherine Center at her very best—a masterpiece of a novel that is both hopeful and hilarious; truthful and wise; tender and brave. 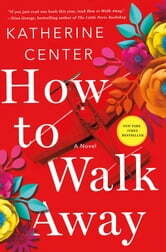 How to Walk Away by Katherine Center is an absolutely amazing book and nearly impossible to adequately describe or characterize. When I received an ARC in the mail from St. Martin’s Press I didn’t really know what the story was about. A break up, an abusive marriage? I thought it would be the usual entertaining, run-of-the-mill chick lit. Well, entertaining – mesmerizing, actually – it most definitely was. But run of the mill it most definitely was not. On the surface it’s the story of a terrible accident and what happens in the aftermath. But it’s so much more than that. Parts of it are so sad you want to sob, but then again parts of it are happy. Not fairy-tale she-got-the-prince-and-lived-happily-ever-after happy, but happy. And full of droll humor, wit, a bit of sarcasm and scenes to make you so mad you could spit. Margaret was always the good girl, the smart one, the one who tried hardest, and it seemed like she had everything including the dream job she was just about to start and the perfect boyfriend she was just about to become engaged to, and it was all changed in the blink of an eye, or the crash of an airplane she had been terrified to get into in the first place. So now what? Layers peel away, and as they do she begins to see that what she thought was perfect and what she thought she wanted maybe wasn’t what she needed in the first place. But now, after the accident, can she have anything? How far below happy will she have to settle? We learn about ourselves and other people in the tough times. But sometimes what we learn is not we wanted to see. And sadly we sometimes learn that some people just cannot cope with tough times. Some are just thoughtless and cruel and say whatever comes to mind. Chip’s comment to Margaret about her appearance had me bursting into tears and almost shouting for him to shut up. Even her family didn’t know what to do and reacted in unexpected ways. It is heartbreaking in the beginning when she doesn’t yet realize what has happened to her and thinks she just needs to rest before she can get up and walk away, and later when she has a question the nurses say, "Now that's a question for the doctor." How to Walk Away is all about Margaret’s condition after the accident, but it’s not about that at all. It’s about her strength and determination and the days when she totally gives up. It’s about how life goes on for the characters that surround her. I got so caught up in the story and the people that I really did forget about Margaret’s accident a good part of the time. Ian was totally unlikeable and mean on the one hand and totally vulnerable and sweet on the other. Many of the scenes between him and Margaret were touching – and heated. And then you would think how can this be? This is after the accident, remember? And he’s just that silent, grumpy therapist. This was truly unlike any other book I have ever read. Sometimes it seemed so real to me that I had to remind myself I wasn’t reading an autobiography. How to Walk Away makes you think about assumptions we make. Not how we take our health for granted, but how we just slide along in life sometimes thinking this is supposed to be and telling ourselves, and believing, that it’s perfect. And when that perfect is no longer possible, what is there? This amazing (did I already say amazing?) story tells you what’s left. In this age of the quick, easy fix, this is a story about something that can’t be fixed, but that must be faced head-on and endured. And how you must truly move on if you are to be happy. How to Walk Away was a very satisfying story. I laughed out loud when Margaret described herself as a desiccated, noodle-legged spinster, and when she and her sister Kitty planned to “Parent Trap” their parents. And I cried – a lot. This book was beautifully written and one I won’t soon forget. I highly recommend it. Thanks again to St. Martin’s Press. A smart refreshing hopeful story of courage, hardship and love. Well worth reading.....inspiring story, well-written with laugh out loud moments. Truly a gem! This is a poignant story about life changing plans for you. I really enjoyed this book. It is not a bright and happy love story which is my favorite genre. BUT Maggie’s story will resonate with everyone. We all have had life kick us(maybe not so hard) and had to make adjustments on our life path. A Must read! I didn’t enjoy this book—I only finished it because it was the only book I brought with me on a weekend trip. The characters aren’t believable and the plot twists are annoyingly predictable.